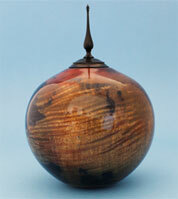 Specializing in beautiful wooden gifts, art, lathe turning, wood bowls, boxes, urns and hollow forms. The WOODEN GIFTS on this site can be functional or can stand alone as a work of art. You will find one-of-a-kind, handcrafted wooden gifts, such as decorative pieces, lidded boxes, salad bowls, burial urns, hollow forms, and natural edge vessels. I now have available for sale - Ron Brown's Amazing Doughnut Chuck, Longworth Chuck Type 2 and more of Ron Brown's best accessories for the wood lathe. Click on the photos to see more items for sale. ETSY - See more of my pieces for sale on ETSY; small bowls, breadboards and more. You will find an assortment of individually handcrafted wood pieces and unique hand turned wooden gifts. Each piece is original and unique, individually crafted by Sam Angelo in Worland, Wyoming, which is located in the heart of the Big Horn Basin. I can accept Visa and MasterCard "phone" orders for specials, custom orders, or items not listed on the web site.